Martin Allen during the win over Salford. Martin Allen hopes today's stunning win over 'probably the best team in the league' will be the start of better times for his Chesterfield side. The Spireites boss pointed out, more than once, that today's 2-0 victory over Salford - their first win in the league since 11th August - made it one defeat in 13 games. He was delighted for his players, who all embraced him at full-time, and the long-suffering fans. "I'm pleased for the players, pleased for the supporters, pleased and happy for the club," he said. "It's been a long time, a long wait. "We all knew it was an important game for everyone at this football club. "Today we played with a great passion, we've done that in most games anyway." Allen admitted that anxiety had crept into the squad after four months without a win in front of their home fans. Today, however, they earned the raucous ovations that greeted almost every tackle towards the end of the game. "I think it had got hard for the players to play here, they were finding it difficult," he said. "The tension and the anxiety of the supporters, the players, their families, all of us. "I thought it was a fantastic performance from start to finish. "Yes our goalkeeper pulled off some good saves at crucial moments, but we're playing against probably the best team in the league. "We gave a good account of ourselves and the backing of the supporters was magnificent. "All these people have suffered. To hear them backing the players. "They sung their hearts out from start to finish, they loved every tackle, every race. "The people here have great passion." The afternoon couldn't have got off to a better start, teenager Levi Amantchi setting up Alex Kiwomya for the first goal after just 90 seconds. "To play an 18-year-old at centre forward I must be mad," said Allen. "It was a great goal, great play from Levi on his debut. "The crowd obviously loved it, all football supporters love a player that's come up through the youth team, come into your side. "He gives us fresh energy and enthusiasm, he listens and wants to do what's best for the team. "I've been waiting too long, in the end I had to play him." With 55 minutes gone Allen's substitution, sending on Jordan Hallam for Tom Denton, resulted in a 2-0 lead. 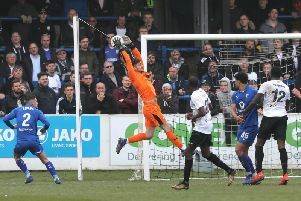 Hallam hared through the middle of the pitch and saw his shot palmed onto the post, but Kiwomya was there again to find the net. Allen said: "I said to him this morning we'll need to win the battle, open the game up and then we'll put you on to do some magic in the final third. "God bless him, he came on and did that, played that role. "He helped us defensively, helping the midfield when they had possession, and on the counter attack he was always going to be a threat." Allen refused to get carried away, calling today's result - which took Town out of the bottom four - another step forward. He believes it could be a catalyst however. "I still think there's a lot more to come from this team. "We're a hard team to play against now, people complain about playing against us, which is nice to hear. "I said it's going to take me some time, it has taken me more time than I wanted it to, but I thought today the players we had were 100 per cent committed with and without the ball. "It's probably the start of something a little bit better, I hope." The manager was approached by a home fan shortly before the final whistle and the pair embraced, to cheers from the West Stand. He's come in for some stick from home fans in recent weeks and revealed that some of the correspondence he's received has been 'disgusting' in content. But he told the assembled press after the game that a pair of encouraging letters from supporters had arrived yesterday, and he plans to meet those Spireites this week to say thank you in person. "The supporters have been really good to me. "I had two letters arrive on my desk yesterday morning. "I rang them both to thank them for their encouraging letters, because when you're in my position you are a bit vulnerable, it is a bit lonely, you don't really talk to that many people. "You manage the players, manage the staff, shut the door and you're on your own sometimes. "I open these letters and it's like wow. "I'll be ringing them both tonight and I'll have them in this week to meet them.